You would have never expected #3! Game of Thrones season 7 just came out, and fans are going crazy! We know you probably stayed up all night on Sunday to catch the season premier. But you're not a die-hard fan if you missed these little, or not so little details. Did you know that six famous musicians have cameoed on the show? There's no doubt that you obviously recognised Ed Sheeran in the first episode of season seven...but what about the others? Season seven kicked off with an epic cameo from our favourite British musician, Ed Sheeran! Dressed as a Lannister soldier, he was singing a ballad straight from George R.R. Martin's, 'A Song of Ice and Fire'. All three band members dressed up as wildlings for the big massacre on season five's 'Hardhome'. They were all slaughtered by the White Walkers and then resurrected into wights. So hopefully, we might see them again. 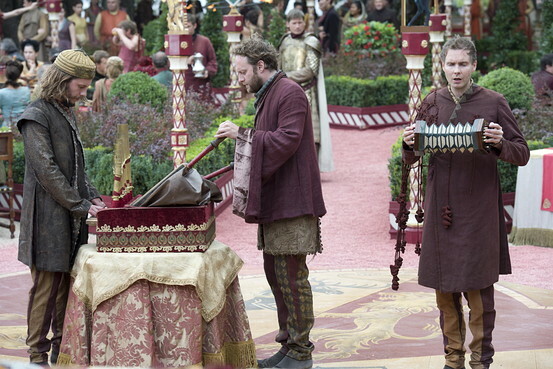 Coldplay drummer Will, played...well, a drummer during the Red Wedding! Until he turned into a traitor, swapped his instrument for crossbows and helped murder the Starks. Not cool, Will. Similar to Ed Sheeran's role, Gary led a group of Bolton men in a sing-a-long. Remember on season 3 when Brienne and Jamie were held hostage by the Boltons? Well that man leading the herd of horses and men, singing 'The Bear and the Maiden Fair' was Gary. Remember during Joffrey Lannister's wedding, he threw coins at some musicians, right before he was poisoned? Well the band was actually the Icelandic group Sigur Rós, who sang the Lannister tune 'Rains of Castamere'. Another Icelandic pop-folk band, Of Monsters and Men made a sneaky cameo during the Braavosi play that Arya attends. Spot them on the balcony there?